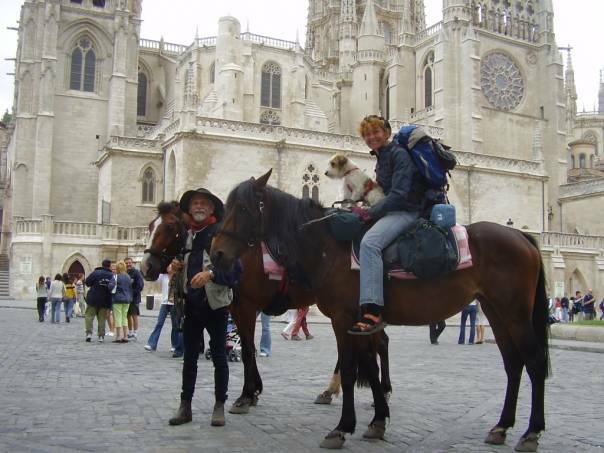 Babette Gallard and Paul Chinn are taking the Pilgrim Route to Santiago de Compostela in Spain! 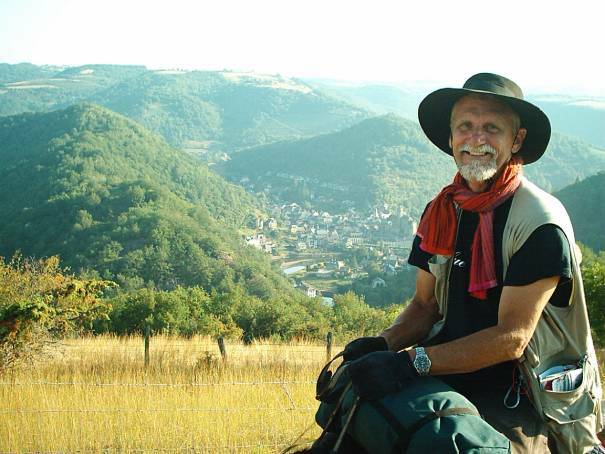 Paul and I are about to embark (29th June) on a 1500 kilometre ride along the St James Way, starting from Le Puy en Velay in France and finishing in Santiago de Compostela, Spain. We expect to be travelling for about 10 weeks, based on a daily average of 26 kilometres with rest days in between – though of course this is only a very rough estimate and subject to every variation. We started our preparations at the beginning of this year and found The Long Riders' Guild website as part of our general and often desperate trawl for information. As a result we are slightly more knowledgeable and slightly less desperate, but perhaps even more importantly we have learnt that our trip is just a stroll beside the other expeditions we have read about - a humbling, but invaluable experience. Other than masses of enthusiasm and commitment, we don’t have much to speak of in terms of what is needed for an expedition like this. Paul has only ridden consistently since March of this year, and although I come from a horsy background (having started out at a very young age in the eventing world and latterly dressage on a professional basis in Germany) all that finished over twenty years ago and has very little relevance to the long distance riding we want to do now. Plus we do not have a large budget and have had to match our mounts and equipment to what we can afford. But, having taken early retirement, the one thing we have in abundance is time and we have used it with so far extremely good results. Our three horses each have a sad story to tell, two of them were unbroken and one was a few steps away from the slaughter house, but at the time of writing we have a willing and adaptable team that has already proved itself in a number of tough trial runs prior to leaving. Gwendolyn, a 16.1hh, seven year old mare, breed unknown though possibly from the traditional French Trotter stock, deemed unrideable as a five year old and discarded to repent her sins in a sparse field ever since, but fundamentally strong and now very fit. Okapi – our pack pony. A 13hh three year old Poney Francais de Selle. Young for the job but tough, willing and easily capable because we don’t intend to push too hard on weight or distance. Lubie (meaning whim in French – how appropriate!) our only broken horse, a six year-old, 15.2hh trotter mare who was too slow for the track and too tough for the dinner plate. We felt sorry for her and she had a kind eye. No regrets. She has proved to be the perfect and utterly reliable mount for Paul who doesn’t want to canter anyway. Our preparations have been largely focussed on building up the horses with regard to condition, fitness and travel training. We have spent a great deal of time in researching and looking at equipment, feed and the specifics of travelling with horses, a process which the Long Riders' Guild and its members have made far easier than it would otherwise have been. Our choices in terms of equipment have been influenced by the need for weight reduction but also durability, and we have found that most of what we need is available here in France where we live. There have only been two exceptions to this. First, the Custom Pack Rigging pack saddle, chosen for the excellent support given by Kelly and because there was nothing comparable locally. Second, the plastic Swiss Boots as opposed to shoes, a choice made on the basis that I have always preferred horses to be unshod if at all possible, and because good farriers will be in short supply or at least hard to find where we are going. None of our horses have been shod before (which makes the transition easier), but we have set aside ten weeks to test the boots and it has definitely been worthwhile. All three horses are now wearing them daily and have managed tough terrain and journeys of over 35 kilometres without incident. Of course we won’t know whether our choices and preparation will prove to be right or sufficient until we test them, but we’ve done our best and as long as the horses are fine we’ll keep going and report as regularly as we can. 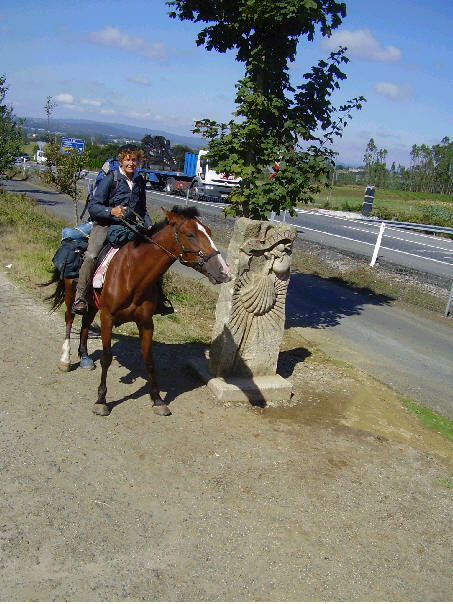 Babette, Paul and the team are following in the devout footsteps of several Long Riders - please click here to go to the page about the Pilgrim Route to Santiago. Good luck, all of you, and have a safe trip! "One third along the St James Way and just one thousand kilometres to go! The team has encountered every kind of terrain, beautiful, spectacular and some of it extremely difficult for the horses, but everyone has coped well and adapted to the routine of staying in a variety of accommodation and moving onto a new place each day. Apart from a minor injury with one horse, Gwen (which meant waiting 5 days for a farrier), everyone in the team is very healthy and much fitter than we when we started out. The equipment is standing up well too, though we learnt very quickly that we have far too much and could probably manage without the pack pony. It’s likely that we’ll gat him picked up before we go much further. The people we meet on the way complete the experience and in spite of struggling with heat and tiredness, we are enjoying every minute and looking forward to crossing into Spain very shortly." Every good Long Rider says the same: "..we learnt very quickly that we have far too much"! Congratulations on making what sounds like an excellent journey so far. "With one thousand, one hundred kilometres completed we are half way across Spain and have just three hundred and ninety-five more to go. I think this qualifies us to be called Long Riders, and that includes the dog, Vasco. Okapi, the pack pony went back home just before we left France and we are managing well with a couple of small rucksacks instead. The two horses continue to attract interest and enthusiasm wherever we go, though travelling in Spain is sometimes more difficult than in France because the majority of places where we stay are not prepared for horses and feed is difficult to find. But we are learning fast and finding that needing help is bringing us into contact with the local people. In France, poor old Gwen was attacked by a swarm of hornets that left her with bites all over her body and unfortunately one under the saddle. This then became infected, which meant we could not ride her for about ten days, but perhaps it’s was time we got on our own two feet anyway. But now we are back to full strength, still loving every minute, still meeting new and amazing people everyday and still looking forward to reaching Santiago de Compostela, which we expect to be in about three to four weeks time." They've made it to Santiago! 75 days from Le Puy en Vallee in France to Santiago de Compostela in Spain, 1550 kilometres in all. The best experience of our lives but just the beginning. 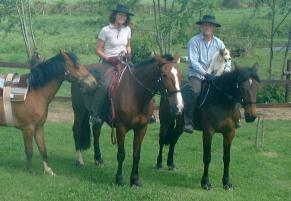 Our wonderful horses have done everything we could have asked of them and a great deal more. Vasco is probably the most photographed dog in Europe and there are quite a few of us as well. Now we are back home and the horses are getting a well-earned rest of at least eight weeks. Gwen has lost weight but is already showing signs of putting it back on in just four days. Lubie is fit and sleek but the pressure on her back has left her with a white patch (we’ll work on improving our weight distribution for the next trip). Vasco is showing no signs at all, while Paul and I have lost five kilos each. And what next? Well Jerusalem is the ultimate plan, but first we must decide which way to go – either via North Africa or south from here in France to Rome – and how much we can do in the three months of summer available to us next year. Our thanks go to all those people who have helped and supported us to this successful conclusion, but of course the biggest thank you goes to our incredible horses, Gwen and Lubie."